How Do You Make That Final Agency Selection? How Do You Make That Final Agency Selection? from AAR Partners on Vimeo. Well, you’ve spent weeks, if not, months going through this agency review and it all culminates down to the final pitch meeting where you make that final selection? Or does it? You see the final pitch is just that… a final meeting but your evaluation of the agency should have started weeks ago at the RFI stage. In other words, what happened at those previous meetings? Did the agency have solid conversation? Did they listen to your input and direction between them and the final pitch? Did they progress from the previous meeting? Most of all, did they raise your confidence level? The final pitch is just the “formal” meeting where everything presented is “buttoned up” but it’s just the beginning. Making that final agency selection is supposed to be quite difficult and if the review was run properly, it will be. But the decision is not based 100% on the final meeting. It’s an aggregate of all meetings, discussions, insights, learnings and more leading up to that pitch. And it’s the agency that moved the needle the most, learned the most, challenged you the most and left you with the most confidence is the agency who should be trusted with your account. There you have it. 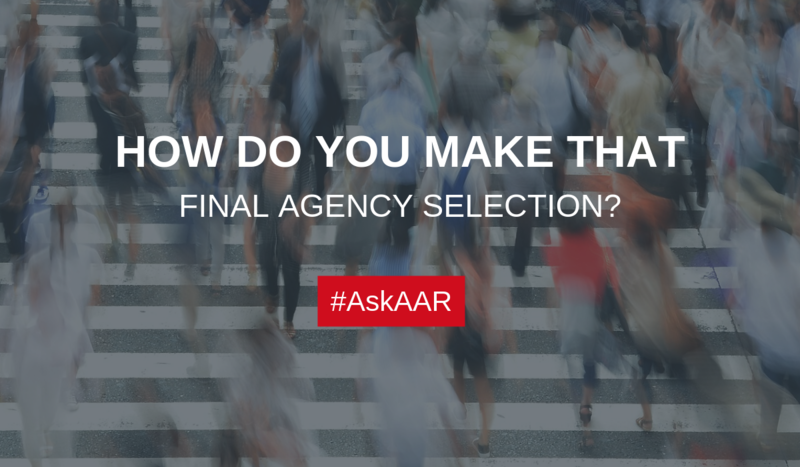 If you have a burning question about your agency search, AskAAR by posting your question on Twitter or LinkedIn but be sure to hashtag it with #AskAAR. Every month I’m right here answering your questions.